Two and a half years ago I waxed lyrical about the CD set The Best Modern Hymns Album...Ever! It has remained a constant favourite all that time. It's a wonderful mix of old hymns with new tunes and recently written hymns. 2. reading the fine print. 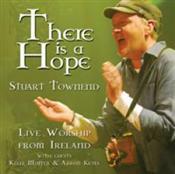 Because if I had done either 1 or 2 I would have noticed that many of the new hymns that have risen to the surface from these CDs and found their way onto my much hammered playlist are from the pen of Stuart Townend. and we like this one in our house too. Beautiful words of truth set to brilliant music. 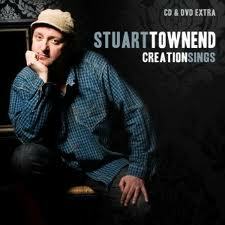 Stuart Townend's contributions to modern hymnody are completely sing-along-able and they encourage, fill with joy, nurture and teach with great richness. Here's one from Creation Sings ("My Heart is Filled with Thankfulness") that had me doing a little jig while I was doing the vacuuming today. Fortunately the footage of me doing a jig while vacuuming isn't available on YouTube! 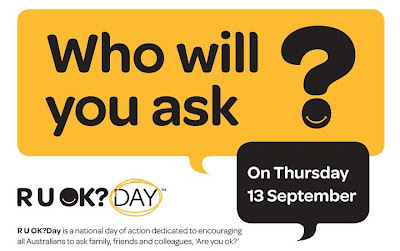 ...a national day of action dedicated to inspiring all Australians to ask family, friends and colleagues, ‘Are you ok?’ By regularly reaching out to one another and having open and honest conversations, we can all help build a more connected community and reduce our country’s high suicide rate. It's prime objective is suicide prevention - and it isn't just about encouraging people to check in with their friends and family just once a year - on the second Thursday in September. It's about getting into the habit of checking in with one another on a regular basis because good communication can nip so many things, that might otherwise escalate, in the bud. So not just suicide prevention, although that's where it started. But learning how to keep our ears, eyes and hearts open and then taking the time to show some concern. There are some obvious targets - people who are on our care for lists (and for those who pray, on our prayer lists as well) - people in great need whose loads are great and difficult. But today I have been thinking about the people who often fall between the cracks as well. Those newly retired or new empty nesters - for some the transition is is unexpectedly difficult. The primary carers of the elderly, the physically ill, the mentally ill, the addicted. The spouse or children of the long term unemployed or of one suffering from long term depression. The boss - it IS lonely at the top - or anyone in serious leadership. Those who have suffered a bereavement more than twelve months ago and who "ought to be over it." There are others I'm sure. It is good and essential to be caring for the suffering. And it is good to be alert to those not quite in the frontline of difficulty and suffering but one step removed. What are some things that come to mind immediately at the mention of David from the Bible? The shepherd boy who took on Goliath. A man after God's own heart. Serving, fleeing from and honouring King Saul. Building a palace and putting in extensive plans for the temple. I am just about at the end of 1 and 2 Samuel, 1 Chronicles and the Psalms in the chronological reading plan - the full sweep of David's life. The narrative of 1 and 2 Samuel and 1 Chronicles is an exciting part of the Bible. It's certainly one of the high points in the Old Testament. It seems as though God's promises to Abraham way back in Genesis 12 are reaching their fulfillment. And the Psalms are a glorious, personal reflection on life in all its highs and lows. But what happens when you interweave the events of David's life with his personal reflections upon those events? Something quite wonderful. To read those Psalms when David is crying out to God when he fears for his life, when he seems to have no support, when he knows he has mucked up, when he is hiding a cave, when he is about to go into a fierce battle - or to read those Psalms when David is giving joyful thanks to God for His faithfulness shown in David's life in personal or national victory and for the pure goodness of knowing, loving and serving God - to read those Psalms when David is overwhelmed and amazed that he should be king - to read all these Psalms alongside the actual action does something amazing. It gives humanity to the events and context to the emotions. And both become all the more powerful for it. Now I haven't done the reading to know this for sure, but I am guessing that we don't know the exact placement for all of the Psalms. There are some that can be placed exactly, either from the small print or from the content. But I'm not sure that we have the information to place all of them precisely. As I said, that may be wrong...I haven't done the reading...so don't quote me on this point. So I can't be sure of the 100% accuracy of the placement of the Psalms against events in the reading plan I am using. However I know the plan won't have been constructed together lightly, and it has read very well to me. And as I have read through this section of readings I've come to the conclusion that this might be a great way to get into the Psalms with children. They all love the action of the life of David but his psalms are a bit harder for children to engage with because some of the emotions expressed will be foreign to them (thankfully), the poetic form and language is unfamiliar and psalms do fall more at the abstract end of the spectrum. To that end, if you are interested in reading through the life of David alongside the Psalms, or having a go at it with your children, I have copied below just that section of the reading plan. It's a list of 50 or so readings, which could be broken down further if you go chapter by chapter and psalm by psalm. Don't be overwhelmed by the volume. What is posted below represents an amazing adventure in Bible reading. I finished the last page of How To Really Love Your Child and then headed straight into the first page of How to Really Love Your Teenager. This too is a very helpful book and one that I will be reading again. Up front, there were a couple of things that I didn't like so much about this one - a few too many anecdotes in this particular volume and occasional comment or idea that I didn't really agree with - but these are perhaps personal dislikes. However there is lots to like. Especially that Ross Campbell offers hope. He seems to work with people of all ages but of all the possible age groups to choose from, I think he loves teenagers the best. He adores them. And he desperately, achingly wants teenagers and their parents to thrive together through these years. This book is full of hope - and I think it is a realistic, attainable hope. Early up in the book Campbell makes the comment that we ought not to regard teenagers as adults. They are still in essence children, albeit children that are getting quite big and independent. Which is not to say that they are not capable of great maturity. In the face of their growing independence and capabilities it can be easy to regard teenagers as fully fledged, independent adults when in fact they still require their parents' love. This is a helpful principle to keep handy. It's a bit like the warning I read when I was immersed in baby books...that when you stop breastfeeding a baby the amount of physical contact they receive - because the close contact of feeding has stopped and because they quickly become toddlers on the go - often decreases by more than 50%. And more so with boys. Yet they still thrive on lots of physical contact. I was glad to be wised up to this advice ahead of time. And I am glad to have been made aware of this not dissimilar trap with teenagers ahead of time. How then to love your teenager? In much the same way you love a child, according to Campbell. Keeping their emotional tanks full with lots of positive eye contact, lots of appropriate physical contact and lots of focussed attention. And focussed attention is the particularly big ticket item - the one where parents of teenagers get to put in the hard yards. He is very clear that once our children are teenagers we don't get to lie back on the sofa with our cups of tea and read our books (or whatever your equivalent idea of blissful relaxation might be), with all that hard, physical toil of raising children behind us. No...there are more hours to be genuinely and lovingly spent with our offspring, and in the teenage years they will likely be at times inconvenient to us - and how we respond when they need some time from us is important. Beyond the principles common to both books, Campbell spends lots of time discussing teenager moodiness, anxiety, anger and general rollercoaster-ness. He seems to get teenagers and I have found reading his insights useful. There is a chapter on teenage depression - and with a good amount of time given to detailing the difference between normal teenage behaviour and behaviour that needs help from health professionals. There is another chapter on how to move from parent control to self control. And a chapter for parents about parental self-control. What I love about the Teenager book, as I have said, is that Campbell clearly adores teenagers and desperately wants parents to do well with them. And he gives parents every hope that they can indeed navigate these years with great joy and success. I think this book is realistic and I think it gives a good pattern for positive relationship. He doesn’t ever suggest that it will be a walk in the park or suggest he is offering a foolproof programme. This is no "Supernanny for Teenagers." He offers guidelines, insight and hope. Campbell also makes it clear that you can’t think things are ever too far gone for this to be of help as we all respond well to genuine, sincere, consistent love - sometimes quickly and sometimes with time. I am no teenager expert. As soon as a child walks out that final year primary school classroom door for the last time I have zero expertise. Having read How To Really Love Your Teenager I feel forewarned and forearmed with a positive approach to the second decade of a child's life. No doubt there are sqillions of other books around on this topic and squillions of other approaches too. For now, to my untrained eyes, this one looks ok and like it might be a good launch pad. In a bit over a decade's time I will let you know how it all went. Feel free to offer your view and your best advice along the way. When our boys were very small a lovely friend at church, whose children were well on their way to grown up, commented that our children would be very fortunate. They would grow up hearing the best stories ever - the stories from the Bible - and wouldn't have to worry about all those fairy tales. With first baby in arms, I was fresh out of retirement from primary school teaching where my forte had been reading, writing and children's literature. I smiled at my friend's comment and thought inwardly, "Yes, my children will hear lots and lots of Bible stories, that is for sure, but we will be reading widely from all sorts of good children's books and stories as well." As it turns out, we didn't read many fairy stories. We've read lots and lots and lots of books of all descriptions but the fairy stories seem to have passed us by. Maybe because that comment has always stayed with me. Maybe because most fairy story books are covered in princesses and fairies and pink...and our boys don't seem to do pink. And so while we have been reading widely, the fairy tale classics haven't ever risen to the surface. I realised this gap in their education when our nine year old came home from school a couple of weeks ago saying that he needed to write a puppet play based on a fairy tale and by the way, what happened in "Jack and the Beanstalk?" So we sat down together and I started to tell the story, only to find that I was bit hazy on some of the finer details. Did Jack just take a golden egg and then the goose or was there something else in between? And what happened to that giant when Jack cut down the beanstalk at the end - did he scamper back up the top half of the beanstalk to his castle in the sky never to be seen again or did he come plummeting down into Jack's garden and meet a horrible end? If the horrible end...what did they do with the body? 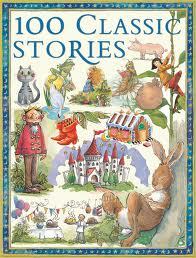 So off we went to the library looking for Jack and the Beanstalk and came home with 100 Classic Stories. What a great book. A blue border and not too many cute pink things on the cover - a good start. And inside it has all the stories I remember hearing as a child, stories I read at school, stories I read to children at school and one or two that I don't know. We have been having all sorts of fun reading a couple of these every night before bed time and getting ourselves all caught up on the classics. Turns out, by the way, the giant did come down with the beanstalk but they didn't mention how Jack and his mother dealt with a dead giant at the base of the beanstalk just outside their kitchen window. Awkward.